In 1832 the three Jackson brothers came from Scotland. They lived south of Glasgow in another county. James 1806, William (Uncle Billy) 1808; Archie 1810. Aunt Mary of whom you speak was my grandfather Ferguson's sister. Mary Ferguson later married James Jackson. It's this way: she and my grandfather Ferguson's parents; Sarah, her brother and parents, were on the same sailing vessel; Sarah married Robert Ferguson - my grandparents. They had lots of time to get acquainted, 13 weeks. ha! So apparently the Jackson boys were on the same boat. They all moved to the Mohawk valley. James rented, since no evidence of owning property. He and James Jr. are buried there. Then William and Archie got inheritance money and went to Albany, there they encountered a Mormon Scout, and together bought 160 acres of Illinois land. They took a place on a caravan to the Ohio River, to Vincennes, Indiana by boat, to East St. Louis by caravan again. They walked to Carthage, 250 miles, presented the receipt, got the land. Said " The man was honest after all. ", and walked to their place. It was four miles east of Nauvoo, located one half mile west and one mile north of my home. In 1838, Billy sent to Scotland for Aunt Ellen (Allyson) and they were married in Carthage. Archie lived with them until 1848, when he bought 60 acres of land and moved a Mormon house on it. Two rooms down, attic up, this was known as Archie Jackson place. "Now, in 1847 Martin and Sarah Little moved from Xenia, Ohio with their children, Lorenz, Gus, Catherine, Frank, Sarah, Mildred and Jane, and pulled east of Nauvoo to scout for land. He bought south of Pontoosuc. In the mean time, Archie met Catherine Little, and April 1848, they were married in Carthage. He was 38 and she was 20. Martin Little gave his boys each 40 acres when they were married, then Catherine an equal share in horses, wagon, material. She rode a horse into Pontoosuc, bought bolts of material, put it in two sacks across her horse. Your mother said grandmother told her the one attic room was full of provisions for her, Jane, Philoma, Catherine, Isabell and on. "When your mother, Isabell Jackson, was to be married, she took her bolts of material to mother (Philoma Jackson-Ferguson) at Carthage, and spent time, while my mother made her things. You have seen the wedding picture with the dress of 15 yards, all those ruffles, I'm sure." Photo of Archibald Jackson farmhouse near Nauvoo, Illinois. 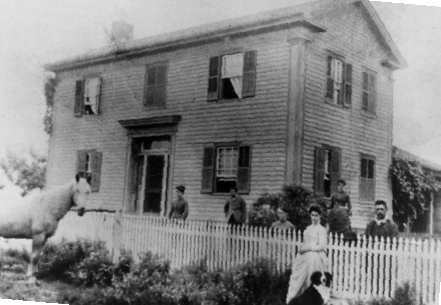 House was built near the close of the Civil War. Jemmoe Dunwody wrote "My mother Isabelle Jackson-Quint said Grandfather Jackson drove to the timber region many miles away, with wagon teams and men and felled the trees, trimmed them, hauled the logs to the planing mils, then hauled the lumber home. Requiring three days of hard labor, they came home tired and hungry."